You must always use your direction indicators (signalling device) to tell other road users what you intend to do. They cannot know your intentions unless you tell them by giving early and adequate signals. It's also important to remember that giving a signal does not mean that other road users must give way to you or that you can automatically change direction without taking care and giving way. In every case, you must give sufficient warning of your intention to alter direction to allow other drivers, motorcycle riders, bicycle riders and pedestrians to act on your signal. In the case of leaving a stationary position at the side of the road, you must signal for at least five seconds to allow sufficient warning to be given to other road users, especially bicycle riders. Turn left or right when driving within a car park. This includes turning left or right to move into a car park space. Cars are fitted with brake lights to indicate that you are slowing down or stopping, and direction indicators (blinking lights on each side of the car) that you MUST use to give a change of direction signal or make a turn. 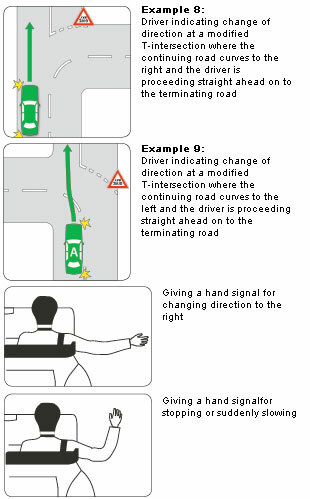 You must stop giving the change of direction signal as soon as you complete the change of direction. If a vehicle's direction indicators or brake lights are not in working order, or the vehicle is not fitted with indicators or brake lights, you must give a hand signal to turn right, stop or slow down suddenly (as illustrated). Bicycle riders are only required to give a hand signal when turning or diverging to the right, except when making a hook turn. make your turn, when safe. in a one-way road, you must turn right from as near as practicable to the far right side of the road. Approach the intersection from the correct lane - you can only turn left from the left lane and right from the right lane. You can only turn from any other lane if it has turning arrows indicating the direction you intend to take. When approaching an intersection and there is a continuous white line separating lanes, you cannot change lanes across this line. if you are driving a vehicle with a Do Not Overtake Turning Vehicle sign and you are within 50 metres of the intersection, you may use either or both lanes if necessary to turn left or right if it is safe to do so (Example 13). When turning from any two-way road, you must not stop your vehicle in a position that could obstruct traffic coming from the opposite direction. It is against the law to enter an intersection if you cannot drive through and into the road you plan to enter. 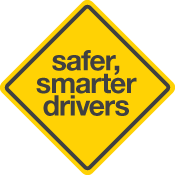 However, when turning right, you can proceed into the intersection and wait near the centre of the intersection for the oncoming traffic to pass (as long as it is safe and the road you are turning into is clear). 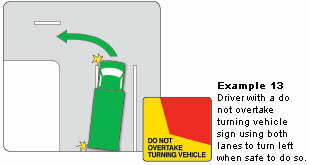 When turning in order to enter or leave the road you must obey the same rules as when turning at intersections. A U-turn is a turn made within a road to take you to the other side, facing the opposite direction, in one turn. There are several restrictions on where you can make a U-turn. At intersections on any road with a dividing line or median strip, you must start a U-turn from the lane immediately to the left of the middle of the road or dividing strip (Example 14). At any other intersection you may start your turn from any position on the road (left of the middle), except from a bike lane or bus lane, providing it is safe to do so. When making a U-turn you must give way to all other traffic and pedestrians and not unreasonably obstruct traffic approaching from the front or behind. you can safely make the U-turn without unreasonably obstructing the free movement of traffic. unless U-turn permitted sign is displayed on traffic lights. The rules for U-turns also apply to 3-point turns. 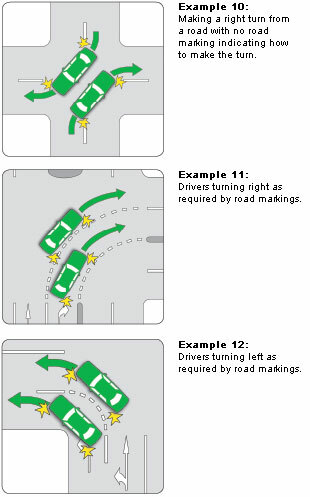 You may do a 3-point turn by using the forward and reverse gears when the road is not wide enough to complete a U-turn. You may only do a 3-point turn if it is safe to do so and allowed by the road rules, and you must always take care not to obstruct other road users. Check the road carefully before starting a 3-point turn and, if the traffic is heavy, it is better to avoid a 3-point turn by driving around the block.